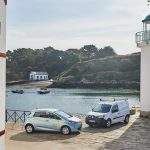 A pioneer of the affordable all-electric vehicle, Groupe Renault is the only manufacturer to offer a comprehensive range of electric cars, which it has just extended with two new innovations. Courtesy of the R240 motor, customers who use the ZOE for everyday motoring will benefit from improved range. Combined with a battery featuring an electronic management system, the R240 motor increases the ZOE’s range by 30 kilometres to 240 kilometres (NEDC). It also cuts the car’s charging times by an average 10% at public charging stations, thanks to the upgraded Caméléon charger. The Twizy Cargo is the version of the Twizy designed for transporting goods. Its rear seat has been replaced by a waterproof boot with a 180-litre load-carrying capacity, accessible via a rear door. Just as compact as the Twizy, the Twizy Cargo is the ideal solution for city delivery or rapid intervention companies. It is fully customisable with decals to advertise your business, and cost-effective to use. The ZOE’s new R240 motor is combined with a battery featuring an optimised electronic management system to offer a longer driving range and improved charging performance. Unveiled at the 2015 Geneva Motor Show, the R240 motor went on sale on in the spring (dates varied depending on the country). More than 25,000 ZOE models are currently on the roads in some 20 countries. The R240 motor’s range, unmatched in the segment, is 240 kilometres (NEDC) – that’s 30 kilometres more than the Q210 motor. 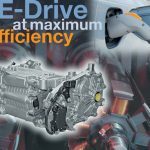 Renault’s engineers improved the motor’s efficiency by optimising its electronic management system. Improved efficiency helps to cut the ZOE’s electric energy consumption when in use, while delivering the same level of performance. A motor which consumes less energy provides a longer driving range. Courtesy of the R240 motor, the ZOE’s charging times have been cut by 10% on average compared with the Q210 motor for everyday driving situations. 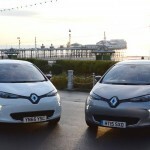 Renault’s engineers have also upgraded the Caméléon(3) charger in order to shorten charging times at low power levels and increase the ZOE’s range. For each minute the battery is charged, users get extra kilometres of range. The ZOE’s new motor helps meet a wider range of needs. 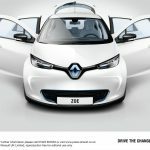 The release of the R240 motor underpins Renault’s policy to bring electric motoring to as many people as possible. The motor’s 240-kilometre range (NEDC) ensures greater flexibility for customers who use their ZOE for everyday driving situations. 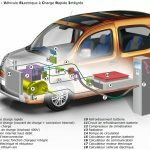 The upgraded Caméléon charger, which is available with the R240 motor, is particularly effective when connected to 3 to 22kW charging points, which make up more than 95% of the charging infrastructure currently installed. In addition, the Q210 motor will remain on sale in the Renault network, so the ZOE can be charged at 43kW fast charging points, particularly by customers who use motorway corridors. (1) NEDC. (2) At low power levels. (3) The CaméléonTM charger patented by Renault adapts to the different power levels available at charging points. It is also compatible with all public charging stations. The R240, a motor designed and manufactured by Renault, in France. The R240 motor was designed and developed by Renault’s engineers at the company’s Technocentre southwest of Paris and at the Cléon plant west of Paris, where it is manufactured. This plant is located near Renault’s Flins plant, where the ZOE is built. 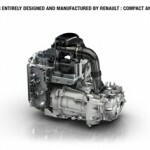 Renault has filed for 95 patents for the motor’s innovative design. The R240 motor is a synchronous electric motor with rotor coil. It features a power output of 65kW, torque of 220Nm and a built-in Caméléon charger. The R240 motor boasts improved range and charging performance thanks to the optimised electronic management of each component, and its size has been reduced. Renault filed for 95 patents for the motor’s innovative design and architecture. Renault’s engineers succeeded in cutting the motor’s size by 10% without sacrificing performance. – Integration: modules are no longer stacked, having been replaced by fully integrated modules. – Downsizing: smaller modules have been designed and assembled to meet precise requirements (gaps reduced between modules, external power cables removed). – Simplification: an air cooling system is now used for the assembly (ducts between modules have been removed). The junction box, the power electronics unit and the Caméléon charger are now in a single unit called the Power Electronic Controller. The unit is 25% smaller. The R240 underscores Renault’s expertise as an engine and electric motor manufacturer. 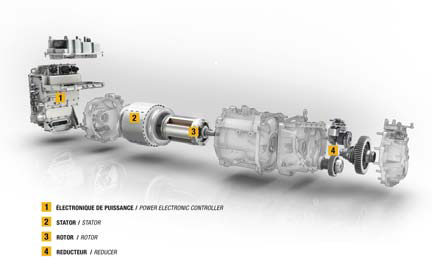 To design, develop and manufacture this high-tech motor, Renault Groupe has drawn on its expertise in the development of both internal combustion engines and electric vehicles. Renault is involved in in the FIA Formula E Championship. Because of its electric vehicle expertise, the Group was chosen as a technical partner to the series. Renault tests EV technology in racing with a view to continually improving the performance of road-going EVs. in coil technology, thanks to upskilling developed within the Alliance. This topic contains 2 replies, has 3 voices, and was last updated by sandy 3 years, 7 months ago. Great, great and great, but the reduced max charging speed means this turns to ZOE into a car that is unfit for frequent long distance use. I would never buy a car limited to 22kW charging speeds. It’s great they are investing and innovating, but the sacrifice they made is not worth it. That little bit of extra range is handy, but in most cases you won’t need it and for longer trips it mostly won’t make a difference But the reduced charging speed will make a huge difference on longer trips. So if you’re absolutely convinced you’re only going to use the ZOE for local trips, you can opt for the R230. But if you currently don’t own an EV, you have to realize: once you get an EV, you want to use it for everything, including longer trips. I know I wouldn’t want to go back to a gasser each time I want to do more than 100 miles.